Number of Guests: Minimum of 6, Maximum of 24. For larger groups, please call 877-613-9653 ext 2 for availability. Add On The PYRO Upgrade To Take Your Immersion Experience To The Next Level!. Perfect for: Executive Teams, Sales Teams and IT Teams! Your team will complete three missions based on real world operations. The ELITE COMBAT SIMULATOR by Desert Wolf’s Xtreme Teams takes Team Building to a whole new level! Become part of a special operations team for a day in this action packed adventure. Your squad will be equipped with uniforms, tactical gear and the most advanced non-lethal training weapons available. These are real rifles converted to fire “man marking rounds”. The same type of training and simulation equipment used by special forces units. VP Team Challenge – Desert Wolf Tours hit it out of the park. No experience is necessary to be a part of this adventure. Upon completion of your training, your team will complete three missions based on real world operations. Add On The PYRO Upgrade To Take Your Immersion Experience To The Next Level! Minimum of 6, Maximum of 24. For larger groups, please call 877-613-9653 ext 2 for availability. Group Discounts available for groups of 12 or more guests. Call 877-613-9653 ext 2 for pricing. A minimum of 2 adult tickets must be purchased per reservation. All vehicles are 4 seat vehicles. If you have 2 empty seats, you may be combined with another group of 2 unless a Private Vehicle Upgrade is selected during the booking process. Use of the discount codes above must be accompanied by a valid corresponding ID at time of tour to maintain discount. Guests under 18 years of age must wear a DOT Approved helmet, by federal law, which can be supplied by DWT. Must be 18 years or older with a valid Driver’s License to operate a Tomcar. For more information, visit DesertWolfTeamBuilding.com. Desert Wolf Tours, which has been taking guests on a variety of excursions and adventures in the Sonora Desert since 2006, now features an innovative style of corporate team building: an Elite Combat Simulator, where co-workers receive realistic Special Operations training developed by the U.S. Armed Forces. Team members first receive realistic military-style training such as weapons tactics, then they’re asked to complete three exciting combat missions based on real-world military operations, including the hunt for Osama Bin Laden. If a group wants the ultimate “immersion experience”, the action and intensity of the Elite Combat Simulator can be further enhanced by adding role players with blank-firing fully-automatic weapons and controlled fireworks that simulate RPGs and IEDs. Successfully completing the training and the missions requires collaboration, communication, strategy, stress management, trust, and accountability, all useful skills designed to make team members work closer together and more effectively – plus have plenty of fun in the process. 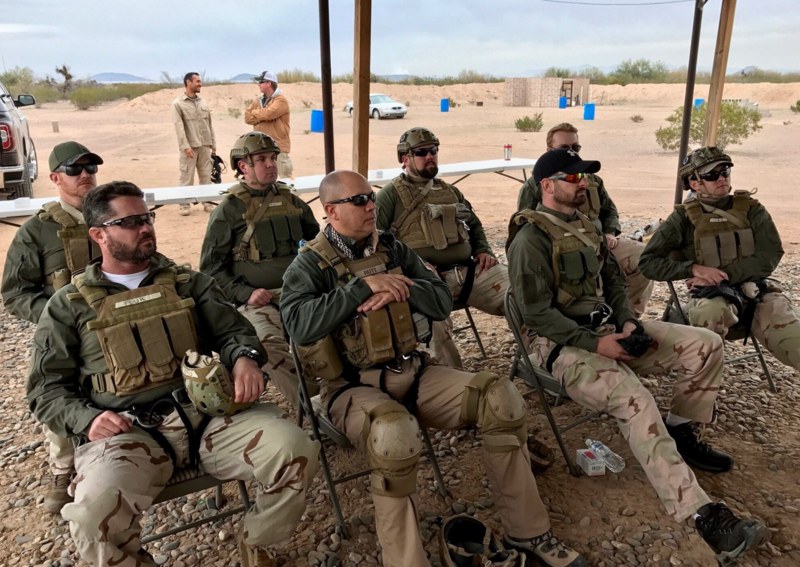 Hunter Corbier, Vice President and General Manager of Desert Wolf Tours, said these intense but safe activities can be beneficial for IT groups, sales teams, or similar employee groups that will benefit from working more cohesively to improve their overall performance. Groups can be as small as 6 or as large as 24. No previous or current military or firearms experience is required.